Sorry I know I'm half an hour late with this post, but I've been out all day and the dentist and then visiting family. CHARLOTTE ELIZABETH YOU ARE THE WINNER!!! PLEASE CONTACT ME (trulypolishedblog@gmail.com) BEFORE WEDNESDAY EVENING WITH YOUR SHIPPING INFO. Thank you everyone so much for joining to win this prize, I'm so pleased I finally got to do a giveaway. Your support for this blog is everything to me and I'm glad to be able to give something back. If you're wondering when my next giveaway will be, I'm going to do it when I get to 75 followers. 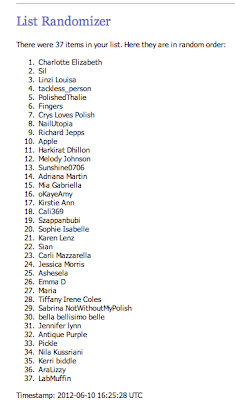 I think it'll be a Rafflecopter giveaway then, because it took me ages to type all of the entries into the list randomiser! I'll be back tomorrow with a polish post, I'm not sure if it'll be a NOTD or not, it depends whether I can come up with something cool!